This is Part 1 of a two-part photo gallery featuring Dina Lydia, the Costume Goddess. Dina has contributed over 50 articles to this web site. 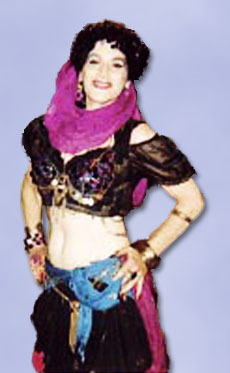 Here in Part 1, she shows some of her regular belly dance costumes. Part 2 showcases some of the novelty costumes she has created for herself and others. This photo gallery shows some of Dina's costume creations. These five photos show how Dina gives the same bra / belt set costume differing looks by using various types of sleeves. 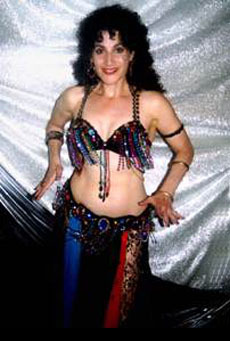 Dina put this look together to go with her Spanish - style fusion piece to the song "Amayaguena". She is wearing lace sleeves attached to the bra. 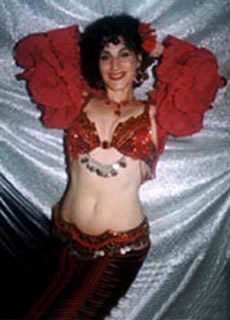 When Dina wears the large ruffled sleeves shown in the photo to the left, her arm movements tend to be flamboyant rather than snakey or subtle — the costume influences her dancing style. In the photo on the right, Dina is wearing triangle-shaped chiffon shoulder drapes. Click on this photo to see it in more detail. In this photo, Dina is modeling velvet gauntlets that match her pantaloons with a chiffon scarf attached. 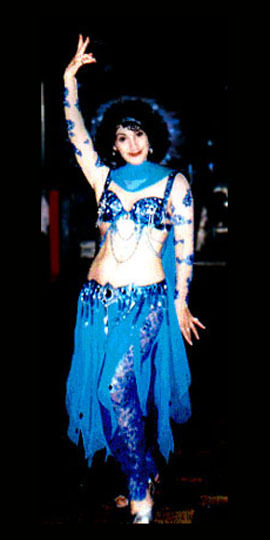 This is turquoise and silver with a "feathery" style skirt of silk chiffon and flesh-colored mesh sleeves with sequinned appliques which match the sequinned lace pants. The bra is studded all over with turquoise, blue, amethyst and diamond jewels. 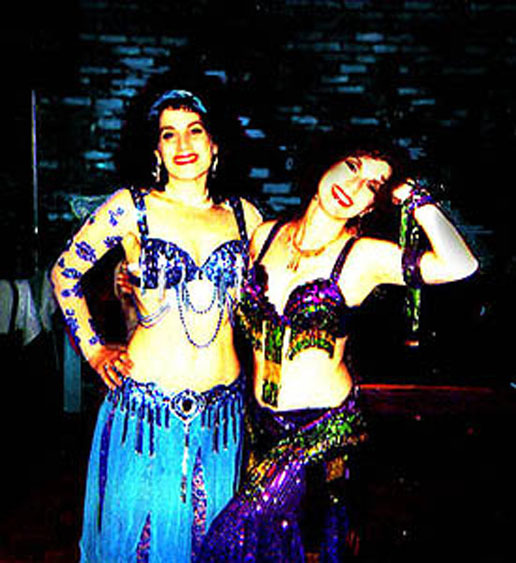 In the photo to the right, Dina is joined by her friend Katia who is wearing a purple and green costume that the two of them designed and made together. Click on either photo to see the costumes in more detail. 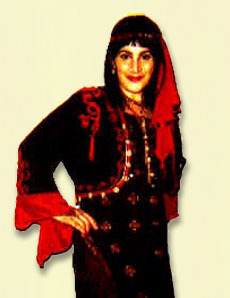 This is a baladi dress which Dina admits she pretty much shamelessly copied from Hadia's instructional video Number Five, The "Raks Baladi" section. Dina's is sheer turquoise on black stripes, with sequinned trim, paillettes on front and black fringe on bottom. She is wearing it with sheer black pants, a beaded copper hip scarf (hard to see) and copper shoes and copper metallic head scarf. It's open down the sides and she's wearing a black bra — a plain one, because a decorated bra might snag the fragile dress fabric. Click on the photo to see the costume in more detail. 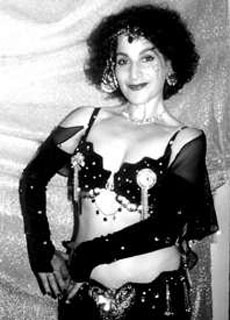 This is Dina's idea of a Gypsy-style costume with a sheer black peasant blouse with coin-festooned bra worn on top, and sequinned ghawazee-style vest over that. Several scarves and coined belts, multi-color cotton gauze skirt, lots of jewelry and face-framing gauze scarf drape. Dina uses this for Turkish, Gypsy and international music - it may not be authentic, but it sets the mood!! In this photo, Dina appears with her pals Yemaya (on left) and Mahira (on right). 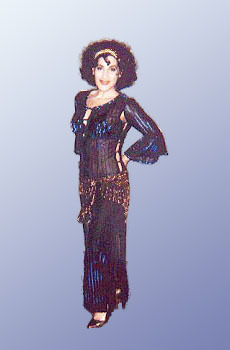 Dina is wearing a costume with silver and gold tassels on white velvet with white jewels and silk chiffon "Feathery" style skirt and arm bands. It is accessorized with a metallic white choker with tiny coins. This is simply a beautiful silver and black veil draped over Dina, but to her it communicates the magic of belly dance. This is a bolero-style ethnic jacket decorated with red cord in two thicknesses which Dina twisted into a pleasing design, then sewed in place by hand. She added beaded tassels front and back, gold coins all around the edge, and a faux undersleeve extension in red silk. She wears this over a calf-length sheath with red and gold metallic motifs and slit sides, red and black harem pants and beaded shoes. A little pillbox hat might complete the "all-dressed-up-in-the-harem" look. 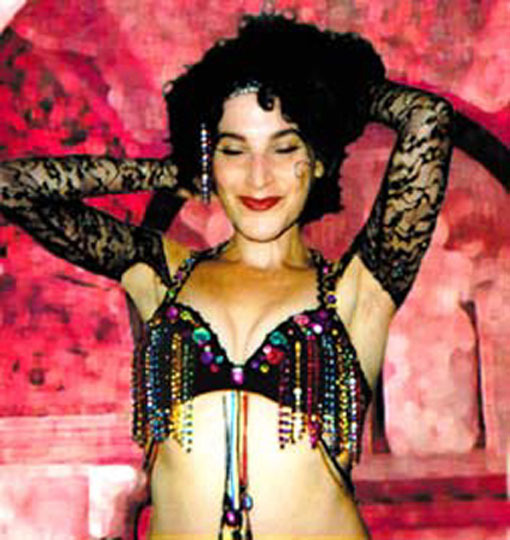 This costume is made from multi-color jewels, beads, paillettes, sequins, and silk chiffon scarves over black velvet, lace and rayon. 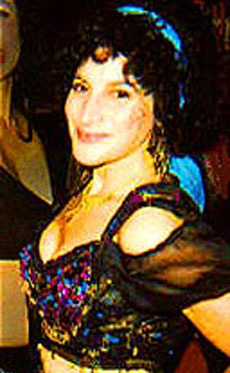 The photo to the right shows Dina wearing this bra / belt set with lace sleeves for a varied look. Click on the image to see the costume in more detail. This costume is made from black velour decorated with silver coins, chains, tassels, bells and rhinestones. The pants are silver and black lace and a black chiffon skirt goes over that. Black net sleeves are sprinkled with tiny rhinestones. A silver sequined headband is hung with silver jewelry. Dina was going for maximum contrast here — black against skin, and silver against black. The neckline of this dress is inspired by the cut of the coats worn by women in the Ottoman Empire in the 19th century. The neckline is cut in a keyhole shape to expose a costume bra underneath. The word "Ghawazee" is used to describe it because European visitors to Egypt during the 19th century saw public women known as the Ghawazee wearing the clothing cut with this style of neckline. This concludes Part 1 of 2 of the photo gallery for Dina Lydia, the Costume Goddess. Click here to view Part 2.